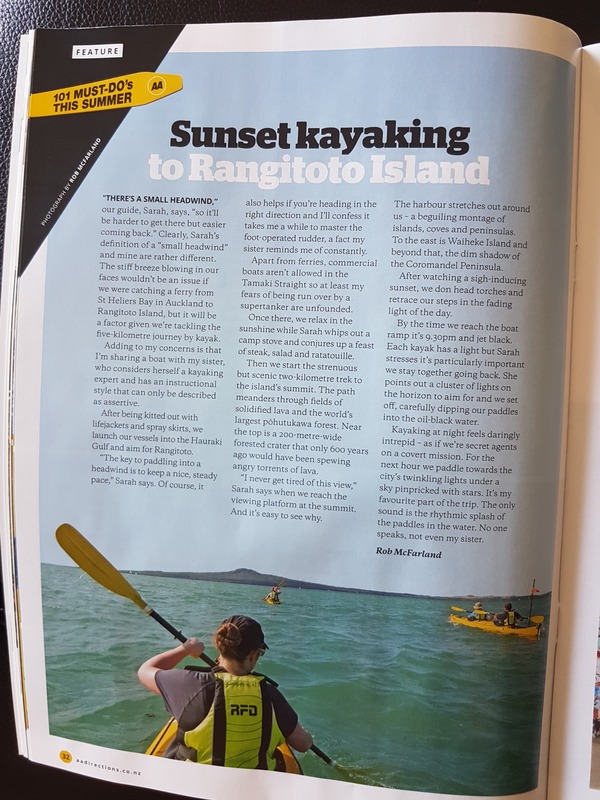 Auckland Sea Kayaks has been featured as one of the Must-Do in New Zealand. "Kayaking at night feels daringly intrepid - as if we're secret agents on a covert mission. For the next hour we paddle towards the city;s twinkling lights under a sky pinpricked with stars. It's my favorite part of the trip. The only sound is the rhythmic splash of the paddles in the water. No one speaks, not even my sister." 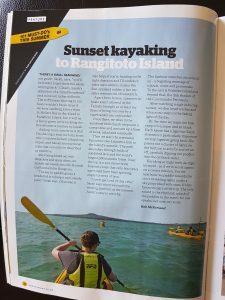 The above is an extract from the article written by Rob McFarland on the Sunset tour to Rangitoto that he did with his sister. It was published in the AA travel magazine in the 101 Must-Do New Zealand section. The 101 must-do list is put together by the New Zealand Automobile Association (NZAA or AA). The AA has more than 1.4 million members throughout New Zealand (as of 2015). The AA is also an advocate for creating a better and safer driving environment for New Zealanders. It has been supporting kiwi drivers since 1903 making it the largest and oldest motoring club in New Zealand. The AA is an incorporated society that provides a range of services to its members including free motoring advice, breakdown services, vehicle repairs, driver licensing, driver training, travel maps, accommodation guides and bookings, insurance and finance.